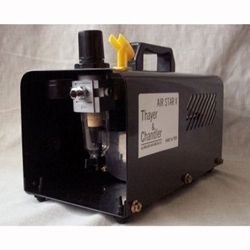 Thayer & Chandler Air Star V Compressor... Quiet, lightweight automatic shut-off piston compressor features an adjustable air regulator and pressure gauge, built-in moisture filter and airbrush holder. It has an automatic on/off switch, and a maximum running pressure of 40 PSI. This 1/8 horsepower oil-less compressor is maintenance free. Also includes a self-cleaning reed-type valve. Unit requires an attaching air hose with a 1/4" fitting diameter. 115V, AC. 1.2 Amps. 1720 RPM. 12"L � 6"W � 8"H.